Music and art were the interconnected passions of artist William Sidney Mount’s life. Mount was one of the foremost pre-Civil War genre painters in the United States who lived in Stony Brook and Setauket, Long Island, for the majority of his life. Born into a family that loved singing, dancing, and performing music nearly as much as handling a paint brush, Mount’s preoccupation with American indigenous folk songs became both a hobby and an important artistic reservoir. His first self portrait, painted in 1828, shows the confident 21-year-old artist grasping his flute in front of a steady, purposeful gaze. 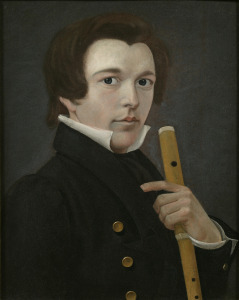 Self Portrait with Flute, 1828. Oil on panel. The Long Island Museum, Gift of Mr. & Mrs. Ward Melville. Later in his life, William spent close to a decade, from 1851 until 1858, designing and refining a violin which he received a United States patent for, an instrument he called “the Cradle of Harmony.” The creation, which he also referred to as his “hollow-backed violin,” was designed to produce louder music that could be heard above the other cacophonous noise of the local country dances he often performed at. 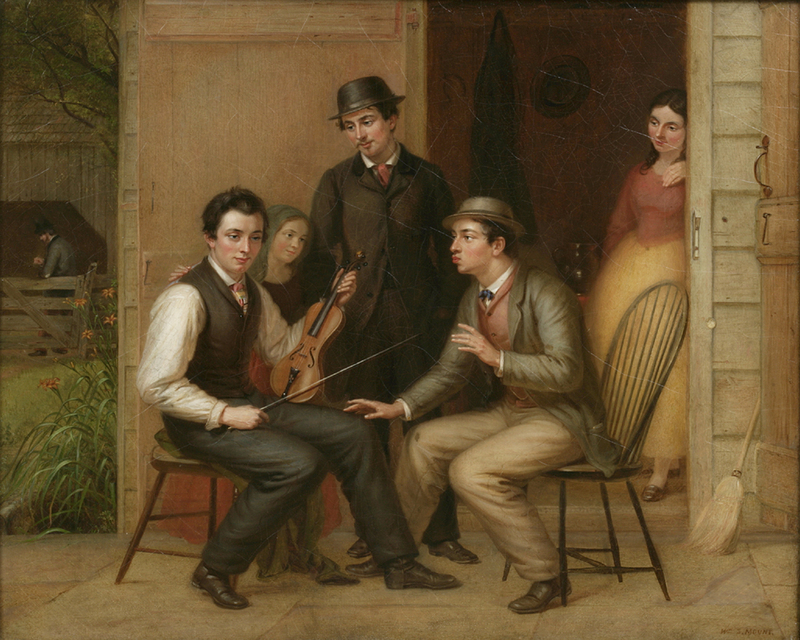 Additionally, there are many hundreds of musical arrangements and folk songs which the artist transcribed in the 1840s and 50s, which still exist today in the Long Island Museum’s archives. I saw recently a scene which I think would make a good Picture. It was two musical characters. One was whistling a tune, and the other was sitting in a listening attitude with violin in hand ready to commence playing when his crony had finished his part.—The Subject no doubt is a hackneyed one, but I do not believe any one has handled it as you can. Catching the Tune, 1866. Oil on canvas. The Long Island Museum, Museum Purchase. Looking for a unique contemporary musician’s perspective on Mount’s violin music, the Long Island Museum recently commissioned an accomplished professional fiddler, Chris Tedesco of Rockaway Beach, to work with us on creating a new video. Tedesco had a chance to enter the LIM archives, handle Mount’s violins and sheet music, and even draw some sound from Mount’s 1857 “Cradle of Harmony.” Afterwards, Tedesco was invited to the nearby Mount-Hawkins Homestead, the National Register of Historic Places home that Mount spent most of his life in and that LIM now is caretaker for. There, in the front parlor of the house, Chris performed one of Mount’s favorite tunes, “Rustic Reel.” Please watch and enjoy the video below. The Long Island Museum of American, Art, History & Carriages, in Stony Brook (http://www.longislandmuseum.org), is the nation’s leading repository of paintings, sketches, artifacts, and archival material related both to William Sidney Mount and other artistically gifted members of the Mount family, notably his older brother, prominent portrait painter Shepard Alonzo Mount (1804-1868). The subject of Mount’s musicality has received significant scholarly attention in the past, including most recently in Christopher J. Smith’s The Creolization of American Culture: William Sidney Mount and the Roots of Blackface Minstrelsy (University of Illinois Press, 2013), Alan C. Buechner’s “William Sidney Mount’s ‘Cradle of Harmony’: A Unique 19th Century Violin,” Journal of the Violin Society of America, 3, No. 2 (1977), 35-71, and Catching the Tune: Music and William Sidney Mount (The Museums at Stony Brook, 1984). For other aspects of Mount’s biography, career, and influence upon American art, see especially Deborah J. Johnson et. al. William Sidney Mount: Painter of American Life (The American Federation of Arts, 1998), and Alfred Frankenstein’s William Sidney Mount (Harry N. Abrams, 1975). The museum and the author would like to thank Chris Tedesco for his unique insights and talents that were critical to this project. William Sidney Mount, letter to Robert Nelson Mount, 1 October 1843; William Sidney Mount, journal entry, 16 February 1863. Both from the Long Island Museum’s archives. Robert Nelson Mount, letter to William Sidney Mount, 28 July 1840, Long Island Museum archives.